IN CONJUNCTION with its 60th anniversary, Brunei Press Sdn Bhd organised a fun-filled day for the children of Pusat Ehsan at the centre’s Football Field in Kg Bengkurong yesterday. 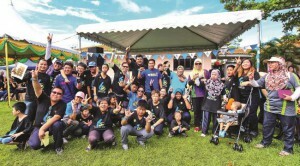 The ‘Fun Day at Pusat Ehsan’ was part of the company’s ‘Reach Out’ programme. The guest of honour at the event was Dato Paduka Mohd Alimin Abd Wahab, Acting Chairman of Pusat Ehsan. Also present at the event were Reggie See, General Manager of Brunei Press Sdn Bhd; Hazizah Osman, the Deputy General Manager; Pg Datin Hjh Noraini, Executive Trustee of Pusat Ehsan; along with other Board of Trustee members, teachers, volunteers and students of Pusat Ehsan as well as other managers and staff of Brunei Press. During the event, a welcoming remark was delivered by the General Manager of Brunei Press, where he stated that the Brunei Press ‘Reach Out’ programme is planned and organised by the Corporate Social Responsibility (CSR) committee of the company for the well-being of the people in the Sultanate.